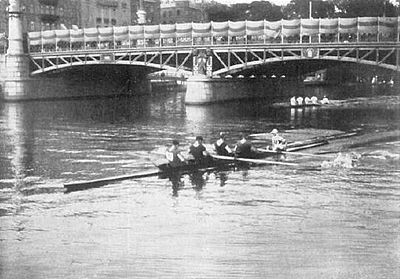 Thames RC coxed four took an Olympic silver medal in Stockholm in 1912: bow Julius Beresford, 2 Karl Vernon, 3 Charles Rough, stroke Bruce Logan and cox Geoffrey Carr. Out of the twenty-four British oarsmen competing at the Stockholm Olympic rowing event one hundred years ago, Geoffrey Carr (1886-1969) is probably the least known of them all. Carr, who was born in Putney, was, according to Geoffrey Page in his magnificent Hear the Boat Sing: The History of Thames Rowing Club and Tideway Rowing (1991), an Anglian coxswain who had been recruited by Julius ‘Berry’ Beresford to steer the Thames RC’s four at the Olympic rowing regatta at Djurgårdsbrunnsviken in the Swedish capital. In England at the time, the coxed four was regarded as a second-class boat type ever since ‘Guts’ Woodgate had invented the coxless four at Henley in 1868. But as the race course was not really straight on Djurgårdsbrunnsviken and the boats were also to go under a couple of bridges, the Swedish regatta organizers had insisted that the boats competing should have a cox – of course with the exception of the single sculls. Berry and his comrades in the coxless four were therefore forced to train in a coxed four with Carr. The boat they used was twenty years old, Page writes in his book about Thames RC. As Henley Royal Regatta was only a fortnight before the Olympic regatta, Berry’s crew was also training in the coxless four and in the pairs. In the final of the Stewards’, Thames, with Berry, Karl ‘Bean’ Vernon, Charles Rough and Bruce Logan, met New College, Oxford, stroked by R. C. ‘Bob’ Bourne, who earlier in March and April, had won both The Boat Races (at the first row Cambridge sank). Thames was in the lead of most of the race, but at the Enclosure New College was slightly ahead and by then the air went out of Berry’s crew. ‘Bean was convinced that this defeat was due mainly to their having practised so much with a cox, though doubling up in the pairs again cannot have helped’, Page states. 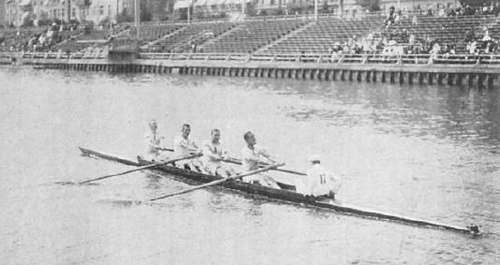 In the Olympic final in the coxed four, Ludwigshafen proved to be too strong for the British four from Thames. The Germans who took the gold were: bow Albert Arnheiter, 2 Hermann Wilker, 3 Rudolf Fickeisen, stroke Otto Fickeisen and cox Otto Maier. At the Olympics, Thames RC’s coxed four first had a row-over, and then beat the Norwegian crew from Studenternes in the quarterfinal, another Norwegian boat from Christiania in the semifinal, and met the Germans of Ludwigshafen Ruderverein in the final. 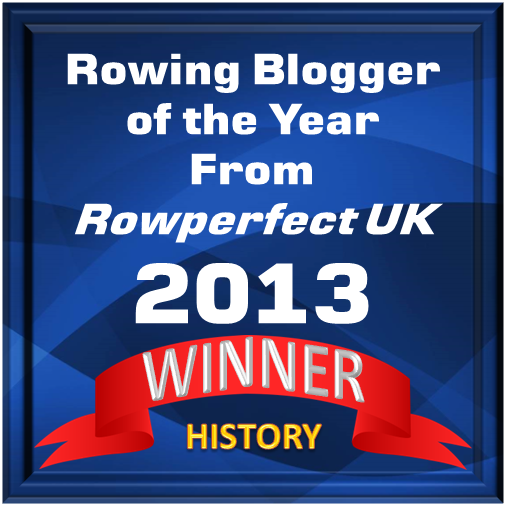 After having rowed neck and neck for the first 500 metres, the German boat took a lead and won with two lengths. I am not sure if Thames RC has celebrated that it is one hundred years ago that Berry’s crew took an Olympic silver medal, but reports from England tell the story how fifty of Geoffrey Carr’s family, from his daughter, Jane Jox 90, to his great-great-great grandchildren got together for a cruise on the Thames in his honour. Read more here. ‘The unluckiest of all […] was probably Charles Rought. A prisoner of war almost from the beginning, he died after eating a bad oyster while waiting to be demobilized after his release, and so technically his death occurred while on active service. Requiescant in Pace’. Instead of boring my friends with my need to catalog my life through music, I'm putting it here. He was a cox'n at Anglian Boat Club from 1902 and won his first open races at Marlow Regatta in 1903. Thereafter he was Anglian's first eight cox until the outbreak of the First World War, winning many senior events in between, including the Thames Challenge Cup at Henley in 1910. He was club captain in 1911-12. He returned to Anglian after the war and continued to be a member into the 1950s. Although clearly a first class cox'n, the question remains as to why why he was recruited into Beresford's four in preference to other Thames RC cox'ns. Great information, Colin, many thanks!